Ready to Serve the GIS Community? Enjoy the GIS Spring and Fall Meetings and Workshops? Now you can get involved in the process! NMGIC is seeking Nominations for the Board of Directors. Self-Nominations are accepted and encouraged! Nominees for the Board of Directors must be general NMGIC members in good standing; legal residents of the State of New Mexico; willing to serve at least two years; and supportive of NMGIC’s mission, goals, and objectives. We are now accepting nominations (including self-nominations) for candidates to serve on New Mexico’s premier organization representing the geospatial community. A nomination should include a brief bio (one or two paragraphs) to introduce the candidate to the general membership. The agenda for the Spring Meeting can be found HERE. Parking at the UNM Rotunda will require a validation code. There is no need to return to your vehicle to display the receipt. The pay station will track the validation by the stall number. 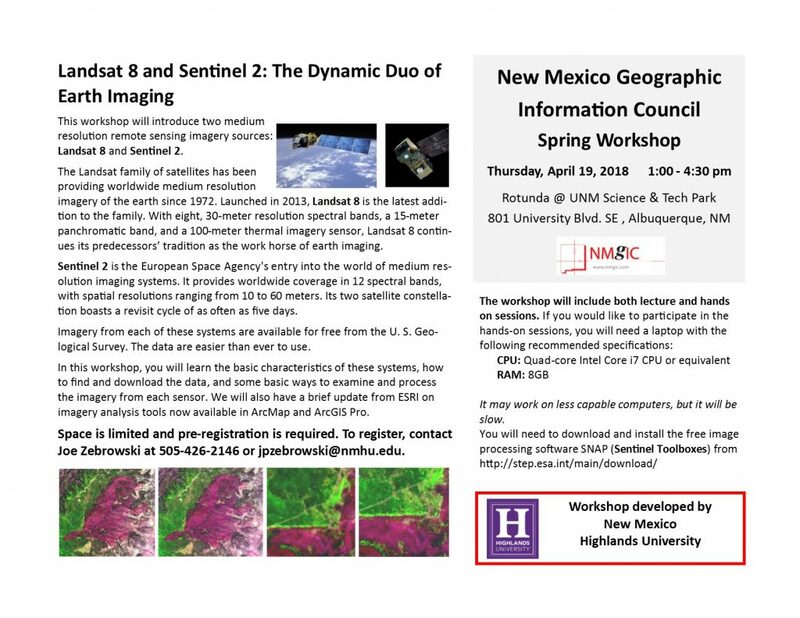 We are excited to announce our NMGIC Spring 2018 Workshop! Workshop Theme: Landsat 8 & Sentinel 2 – The dynamic duo of earth imaging. We are putting together an exciting agenda and will have more information soon! 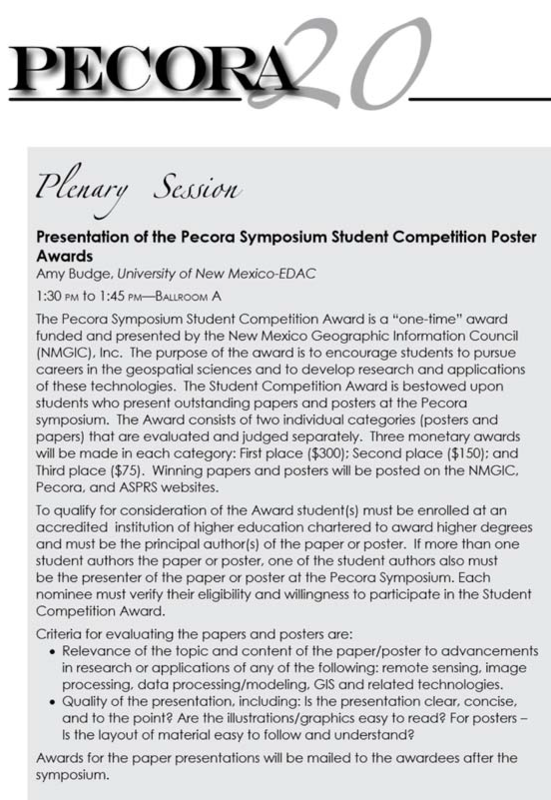 NMGIC sponsored student awards at the 2017 Pecora conference in Sioux Falls, SD this year. The NMGIC board would like to thank Amy Budge and PECORA for bringing our two organizations together to have a positive impact on the field of geospatial technology, and giving students a chance to showcase their work! First place went to Paulo Arevalo from Boston University. His paper title is “Using Time Series and Statistical Inference Methods to Estimate Unbiased Land Cover Change Areas in the Colombian Amazon”. Second place went to Eric Bullock from Boston University. His paper title is “Monitoring Tropical Forest Degradation Using Time Series Analysis of Landsat Data”. Third place went to Samara Calcado do Azevedo from Sao Paulo State University in Sao Paulo, Brazil. Her paper title is “Shadow Removal in High Resolution Remote Sensing Images Using Local Inpainting Strategy”. First place went to Jill Derwin from Virginia Tech. Her poster title is “ Estimating Percent Tree Canopy Cover Using Landsat Time-Series”. Second place went to Lan Nguyen from South Dakota State University. His poster title is “Detecting Land Change Using Land Surface Phenology Modeling: An Application to the Dynamic Northern Great Plains”. Third place went to Yenni Vetrita from South Dakota State University. Her poster title is “Assessing Three Satellite-derived Burned Area Products and Combining with Medium Resolution Data for Characterizing Peatland Fires”. The agenda for the Fall Meeting on October 27th can be found HERE. The William T. Pecora Memorial Conference (Pecora20: Observing A Changing Earth) will be held in Sioux Falls, South Dakota USA November 14-16, 2017 and is being organized by the U.S. Geological Survey, NASA, and ASPRS. The call for abstracts is open now…the deadline for submitting abstracts is June 1, 2017. The Steering Committee wants to announce the call for abstracts and information on the conference to the ISPRS community. Meet your new 2017 NMGIC board members! Thank you to all of our nominees from 2016! Here are your 2017 board members.